This morning I rode an early train to the city and not only enjoyed the rare pleasure of a seat, but also the chance of overhearing a conversation in Spanish I couldn’t understand – except for the occasional word. As a fan of language and communication, I love Melbourne for the diversity of languages it’s possible to hear. Personally, I think one of the most satisfying things to experience is conversing, however poorly, with a stranger in their own language and for both people to be able to understand each other. If you’re interested in picking up a new language and maybe one day practicing with a tourist or even a local, you might want to check out either The Foreign Language Bookshop in the CBD or Intext in Hawthorn. Finally, something to speed up my life. As of yesterday, the ability to use a PIN instead of a signature with a credit card came into effect. Firstly, your signature is ever changing and secondly it’s pretty difficult for someone to detect a forgery in the 1 second they spend comparing the signatures (that is if they even look at all). My biggest pet peeve is the Safeway Express checkout lines which give you no room to sign. You have to use the 6 cm on top of the EFTPOS machine to scratch out something that resembles a 5-year old’s signature. So far I have yet to have a chance to use it but apparently the big retailers (Safeway, Coles, Big W etc.) have had it set up for the past few months. I’d reckon I’d still use the signature for restaurants but everything else is PIN. On the topic of the western suburbs (cheers squirt), and yours truly being a big western suburb fanboy, I’ve decided to sell something that’s quite close to many westies’ heart. 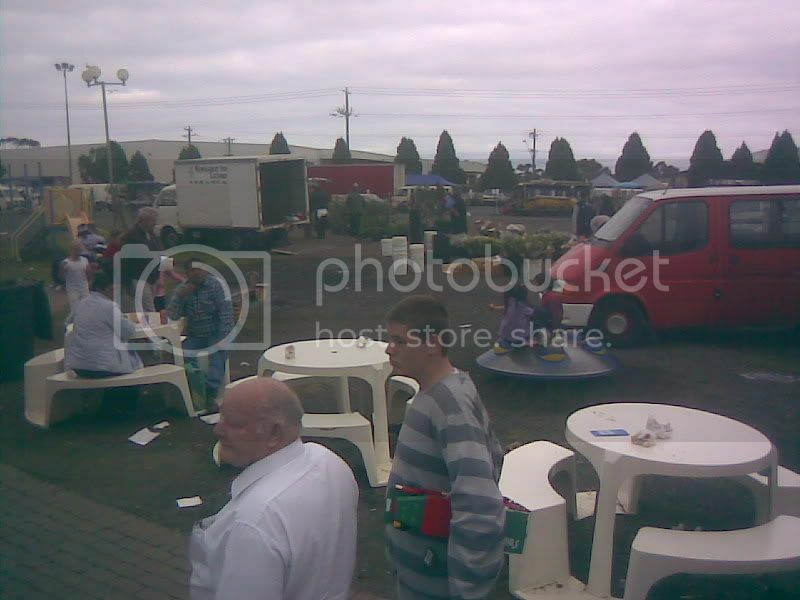 Good ol’ Laverton Market. The pictures here don’t do it justice, coz it was close to the end of the day, and there was an ominous gloom that threatened rain all day. I’ve been to my fair share of markets, both within Australia and Asia, so I’ve seen some good ones. And some really bad ones. 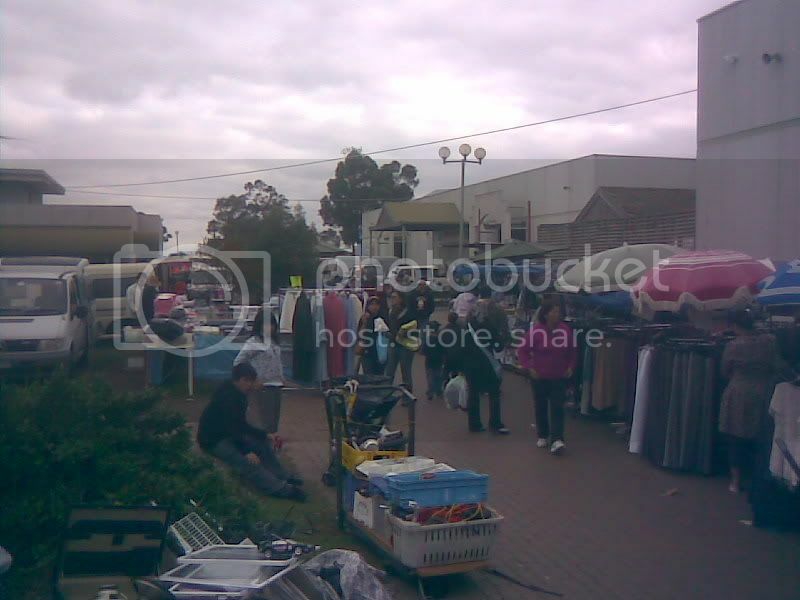 Laverton Market’s somewhere at the top. Great food (double beef patty, egg, bacon and vege burger for $5! Bargain!) and cheap everything. I bought six tubes of 160g Colgate toothpaste for a princely sum of $15. A computer corner table that’d fetch $300 at Officeworks was purchased for $60. A pair of second hand Asics football boots was going for $15, but I haggled and bought it for $10. Then there’s the ubiquitous jam donuts at $6 for 10. There’s a little bit of trash and treasure in every shop. I think if I tried really hard, I might just find a mint ’87 Cobra Commander going for cheap. Over the weekend I was walking around the Bourke Street mall when I spotted the above billboard. Surely, I thought it was only me who had their mind in the gutter. But alas, it’s another ad using double entendre to sell a product. Clever. If only it was Paris Hilton instead of Erin McNaught. After a successful action day last year, Safeway is again running Woolworths Drought Action Day. All profits from Safeway and Woolworths across the country today will be donated to the Country Women’s Association. The Country Women’s Association is working to help farmers suffering from the drought. Even though we have heard little about the drought recently, it is still a serious and desperate situation. Water catchments are at 36.5% (the same amount as last year) and dipping. All you have to do is shop at Safeway today. Can’t be any easier. I have finally gone shopping! Did people go for the Boxing day sale? Did anyone queue up for the big opening early in the morning, 6 am for Myer and 7am for David Jones? I didn’t. So, that’s my shopping done for the year. and more shopping for Christmas! Since Darren has stated the obvious, I should say there will be more people visiting the city as well as all the surrounding shopping malls to do all their Christmas shopping. Most department stores are trading until late for most of this week and will start their 24 hour trading spree on the 2 days prior to Christmas. 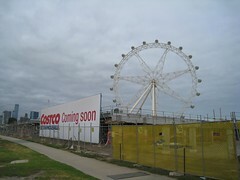 The city, Chadstone and Highpoint are going to be crowded! Think about finding a carpark! So, one tiny little bit of advice … lots and lots of patience. Patience to find a carpark, patience while paying for items, patience while waiting in line to view the Myer Christmas window display, patience while waiting to board a train, tram or bus while all around you are people rushing to get their shopping done.